He was born in Sreerampore, Hooghly, West Bengal. 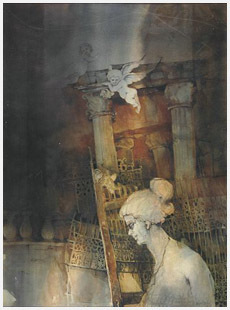 A member of the `Society of Contemporary Artists`, Calcutta. Lives and works in Kolkata. 1984 Studied at Indian College of Art and Draftsmanship, Calcutta. 1983 Solo show, sponsored by Bata India Ltd, Calcutta. 1985 Annual Exhb., Govt. of West Bengal, Calcutta. 1985 Group show, All India Art Exhb., Bhuveneshwar, Orissa. 1985 Group show, Mahakoshala Kala Parishad, Madhya Pradesh. 1987 All India Youth Art Exhb., organized by Lalit Kala Akademi, Calcutta. 1987 Solo show, Jehangir Art Gallery, Bombay. 1988 Solo show, organised by Seagull Foundation for Arts, Birla Academy of Art and Culture, Calcutta. 1988 Young Faces In Contemporary Art, organized by Birla Academy of Art & Culture, Bombay and Calcutta. 1988 Group show, organised by Society of Children Welfare, Bombay. 1988 Celebration of Calcutta Tercentenary Show, organised by Birla Academy of Art & Culture, Calcutta. 1989 Solo show, Dhoomimal Art Gallery, New Delhi. 1989 Solo show, Jehangir Art Gallery, Bombay. 1989 Invited to participate in Bombay Art Societys Centenary Show, Bombay. 1990 Bengal Art Today, organised by Gallerie 88, Bombay. Eight Awards at State & National level. 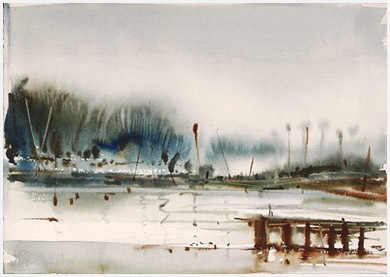 He was known for his watercolours, which had the power to capture the transparent nuances of visual reality.